These are fun trendy styles with a very reasonable price tag. Special Features: Here is a fresh new look from Kyra with a gown that gives some breast support and yet stylish too. Shape and Fitting: Regular fitting - order same size you would in a t-shirt. Kyra Center-Slit Nursing T-Shirt NOW 75% OFF! Special Feature: One center front slit services both sides with a panel down the front for coverage. The panel follows a princess line down the side fronts which gives it a flattering slimming look. Easy care cotton keeps you cool and comfortable! Washing Instructions: Machine wash warm, tumble dry. No bleach. Sizes: S - 2X The only colors and sizes available are on the drop down menu. Note that some are regular round-neck and some are v-neck. Kyra Mock Turtleneck Nursing Top NOW 80% OFF! Special Features: This is called a mock turtleneck because it doesn't really come up very much on the neck. 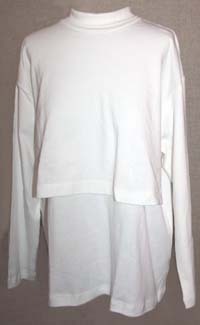 It has the traditional crop top style flap with easy access side cut outs underneath for nursing. It is a solid wardrobe basic that will always be a classic. A great value at this price discount!! Kyra Nursing Jacket Twinset - NOW 75% OFF! Special Feature: This cute style gives the illusion of a shirt and matching jacket but is actually one piece with cut outs on the side of the top for easy nursing access. Another great style that can be worn forever after the nursing time is over. Washing Instructions: Machine wash warm - gentle cycle. Tumble dry on low heat. Sizes: M, L, XL, 2XL, All that is available is on the drop down menu! Kyra One Button Twinset Nursing Top NOW 75% OFF! 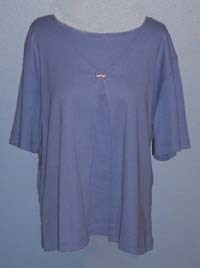 Special Feature: A casual easy access nursing top that you can wear forever after! The inside shirt has easy access cut outs on the side and the outer layer provides your built-in "cover-up". If you see "l/s" next to one on the drop down menu that denotes it as being long sleeve. Remember the deep discounted ones are because of discoloration and will have their actual price next to them. Washing Instructions: Machine wash cold and tumble dry on low heat. Colors: The colors and sizes available will be reflected on the drop down menu. A few at the end of the list are long sleeve (l/s). Special Sizing Tips: This style runs wide. Special Features: A beautiful floral print top, with black capri pants will provide you with style and comfort. The center slit makes easy access for night time nursing. 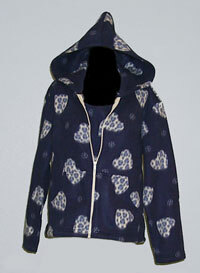 This would make a great addition to your spring and summer loungewear. Color: Floral on black w/ black capri pants. Special Features: This gown is designed for quick nursing! The classic styling makes this one practical and our most popular! 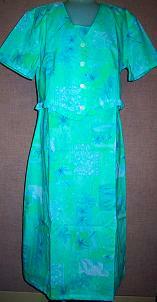 The center front pleat has a slit on both sides for easy access. Washing Instructions: Machine wash and tumble dry low heat. Kyra Silky Capri PJ Set 2047 NOW 10% OFF! Special Features: Cute and comfortable!! The center slit has hidden openings for easy access to breastfeed. This style works great with twins too as there is enough working room! Shape and Fitting: Loose enough to be comfortable in bed but with enough shape to be stylish. Washing Instructions: Machine wash with like colors and tumble dry low heat.